Emotions and identity in different languages have had a lot of press lately. A lot of multilinguals feel different when they speak different languages. Some even go to say that their personality is different. Grosjean puts it down to culture rather than language per se. 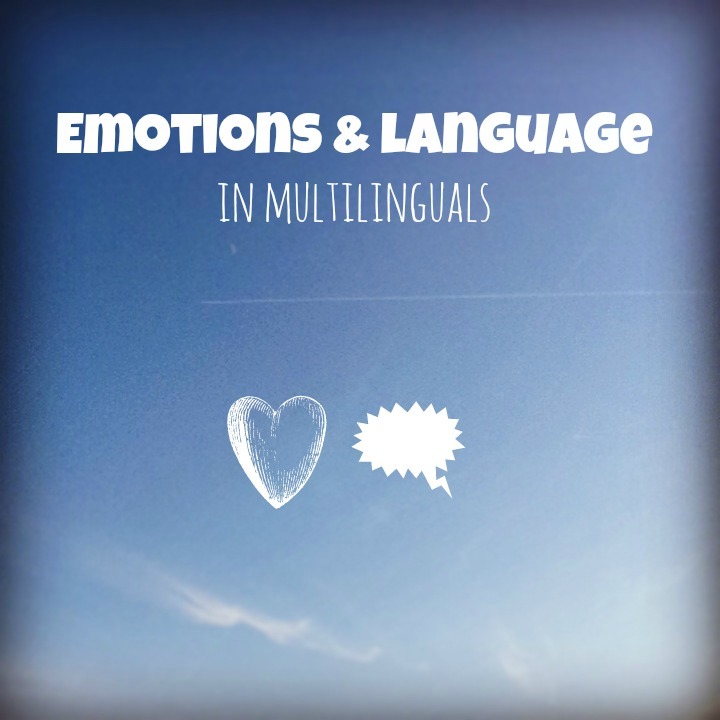 Whatever the reason, multilinguals usually prefer one language to express certain emotions. Do you swear in one language? Do you feel like swear words are stronger in one language over another one? Swearing and love are emotions which are certainly language-dependent. Typically, swearwords don’t sound as offensive in a foreign or second language as in your first language. Expressions of love don’t sound as strong either, according to recent research. Emotions are generally richer when expressed in one's first language (see research sources at the end). Now, while I do believe this is true for swearing (I swear in English never thinking it is that bad). I have a hard time with applying this to love. I think it is not really a question of first (L1) or second language (L2) but rather a question of relationship and, as Grosjean says, maybe culture. I established a relationship with my daughter in French and feel like when I tell her I love her, French is my prefered choice but not because it is my L1. I do tell her I love her in English too from time to time and it feels right too. I have established a relationship with P in English and English is my language of love (can you see me blush here?). I can also convey my love in French to him but I choose English. Just like I choose to speak to him in English about dinner and shopping. Maybe my brain has become English-dominant. Maybe I have become an English speaker. I think in English, I work in English (mostly), I speak a lot of English every day. I may be loosing my French. Skutnabb calls this semilingualism, i.e. a mastery of two or more languages which result in the attrition of the L1.I know my husband, P, certainly feels that way. He feels his Portuguese is getting lost and English is his language for emotions (with me and LJ). Check out this amazing video about love in different languages (as a multilingual). She sums it up perfectly in my opinion. What about you? I would love to hear about your experiences and your language(s) for emotions. Dewaele, J.-M. (2010) Emotions in Multiple Languages. Basingstoke: Palgrave-Macmillan. doi:10.1057/9780230289505. Pavlenko, A. (2012) Affective processing in bilingual speakers: Disembodied cognition? International Journal of Psychology 47, 405-428. I think a relationship can have a language as much as an individual. I started my relationship with my wife in English and now, even though my Portuguese is way better than it used to be, it feels very strange for both of us talking in Portuguese rather than English. I do think so too. We tried switching language but it just feels odd. So interesting! Makes sense that a relationship would continue in the language it was started. In our case, though, it has shifted the longer my husband is in the US (the attrition you mention). Now he speaks more and more English, and so our relationship, which started in Spanish, has shifted to English too. Doesn't feel weird to me anymore because we live in the US, plus it's my native language. I think my husband is in the same situation. But because our relationship started in English, we stayed the same.